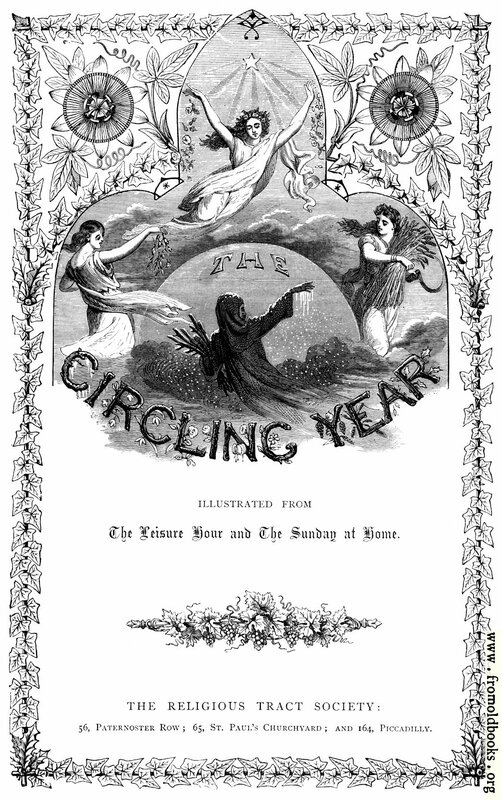 The title page for ‘Circling the Year”for 1870 has a leafy border framing two large flowers at the top, and representations of the year beneath: spring with flowers; summer with warmth from a starry sky; the autumn harvest; Winter with icicles and someone gathering sticks. Illustrated from The Leisure Hour and The Sunday at Home. 56, Paternoster Row; 65, St. Paul’s Churchyard; and 164, Picadilly. The address are of course all in London, UK.